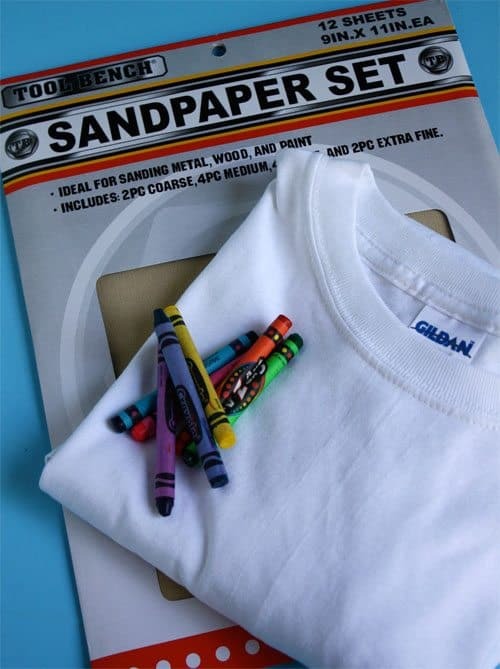 This is a super simple sandpaper printing technique that will keep your kids busy and make one cute shirt! 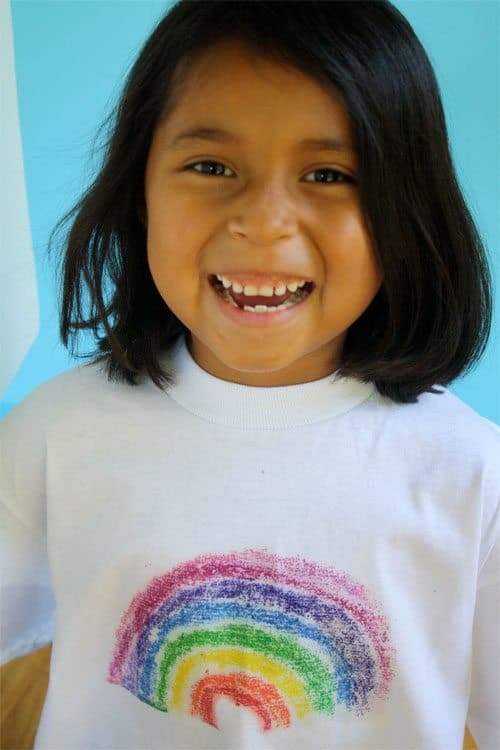 The best part about this fun little craft is that the supplies were bought at the Dollar Store, even the T-shirt! We used crayons we already had so we only spent $2.00 on our new T-shirt. 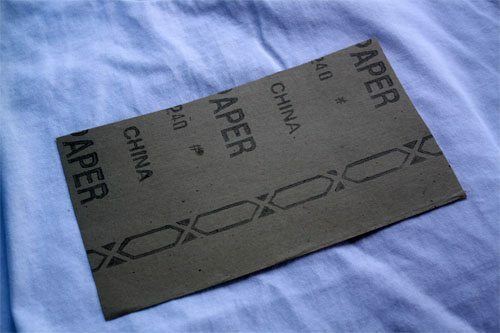 good quality crayons, a t-shirt, iron and fine sandpaper. Our package of sandpaper had a selection and we used the finest. The more coarse sandpaper will provide more texture. Give them all a try! 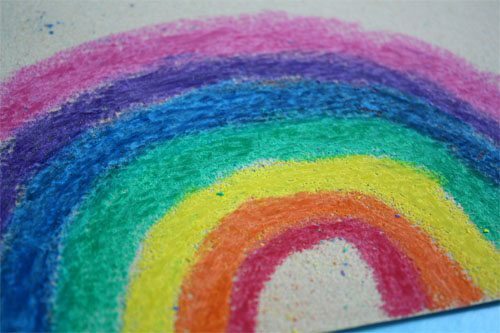 Color a fun design on the sandpaper. Remind children that the image will be reversed. 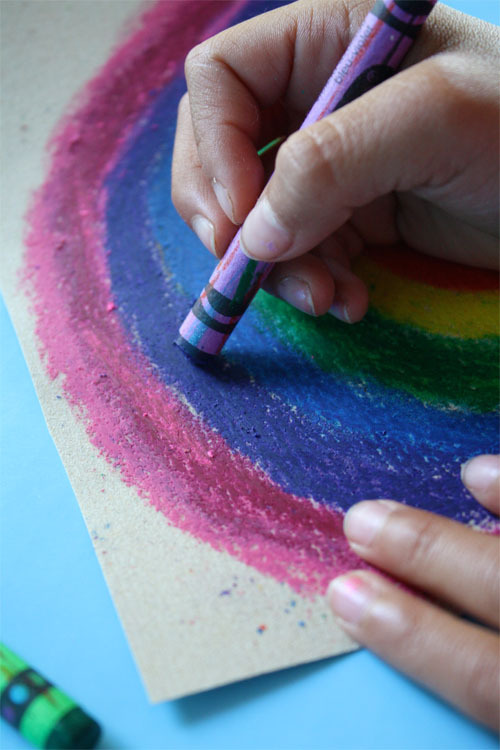 Once the design is colored go back over the design giving the sandpaper an extra thick layer of crayon. Place a piece of cardboard inside the t-shirt to keep the design from bleeding through to the back of the shirt. Position the sandpaper right side down on the t-shirt. 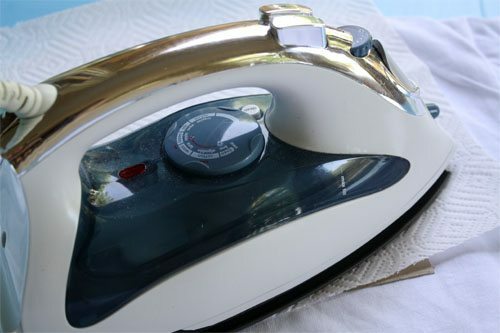 Place a piece of parchment paper or paper towel on top of the sandpaper to protect the iron. Iron, on cotton setting, the sandpaper for about 30 second. Gently lift one edge and make sure you have a good print before totally removing the sandpaper. Iron a bit more if you need to transfer more of the crayon. Remove the sandpaper. You’ll have a print with loads of cool texture–not to mention a new darling t-shirt. To set the color, place a couple of paper towels on top of the design and iron. This will remove some of the extra wax. Toss t-shirt in the dryer for about 20 minutes to set the color. Launder by itself the first time. Every now and then I come across a post worth sharing… THIS IS THE ONE. Such a cool idea! Yes, I must agree….this project was simple, effortless and instant. Perfect! bookmarked for the future and emailed to my sister – this is a great craft! I loved this! It’s so cool, so many ideas to do! I can’t wait to do this with my kids! great idea i want to try! is there another way to set the color if i don’t have a dryer? Perhaps a blow dryer set on the highest setting, do for about 20 min. What a neat idea! I’ll definitely try that with my kids. Great project. I just tried it today to make some Alice in Wonderland themed t-shirts for my daughter’s birthday coming up, and they turned out nice! The only problem I had was once I threw the Mad Hatter t-shirt in the dryer to set, the colors ran and ruined the rest of the shirt, so I’ll be skipping that step for the rest of them. Do you think placing cardboard in the shirt then put the shirts on cookie sheets in a NOT TOO HOT oven would be a good substitute for the tumbling dryer? LOVE this project! We are so doing this! Super adorable. And it looks so easy and fun! what a super idea! thanks! 6 Cool Winter Break Crafts! Just did this with my kids and friends staying overnight. They have had so much fun and so creative. Andrea I had the same thing the first one I put in the dryer bled onto the back of the shirt. I put my drying rack in my dryer and put the other shirts on it for the 20 min drying. Turned out great. Thanks for sharing this great idea!! Instead of the clothes dryer, I used my hair dryer on low setting. I simply put a piece of cardboard between the front and back of the shirt, lay it on the ironing board and blow the image with the dryer (not directly on it) and it works great!!! Do you think maybe blow drying the shirt to let the color set will work? I do not have a dryer rack. i was about to take a nap, but dang stumble upon brought me to this page, and i had to do it. love my new personalized tank top. super easy fun project, thanks! i found this idea really cool… but i doubt that colors will spoil when washed… what say?? How cool!! Thanks for the post. Who ever would have known?How does the image stick though through future washes? Once you “set” the color, can you wash/dry with other loathes without ruining the other clothes or leaving marks in the dryer? This makes sense as far as printing goes. My son left a red crayon in one of his shorts once..my new dress was ruined and I have forever learned my lesson. Hey! I am going to try this ,but since my dryer gets very hot I think I will keep a piece of cardboard between the front of the shirt and back and just blow dry it. That way it cannot bleed through. What do you think? Did this today with my kiddos as a time filler. They LOVED it!!! I ironed all thier pictures on one shirt and now I have another shirt for work!!! I see a lot of comments about preserving the shirt after it is finished but no response. I will be making this today and would love some feedback. Some do’s & dont’s would be a great addition to this blog post.